A number of official Google blogs have just announced that Google Sync – a way of synchronizing your Google Calendars and Contacts with mobile devices – is now available for iPhone and Windows Mobile, and that other devices which support SyncML can also use Google Sync, but only for contacts. Google Sync, which was previously only available for Blackberry devices, uses “push” technology, which means that any online updates made to either your Google Account or Google Apps account – if your administrator has enabled the “Google Sync” option in the Mobile dashboard – are pushed to your device within minutes using your mobile data plan, rather than having to either dock your device to sync with your desktop applications or check Google’s servers for updates every few minutes like POP3 and IMAP mail accounts. Setting up Google Sync on my iPhone was really easy. By adding a new “Microsoft Exchange” account, I was able to enter my Google Account details, select just the “Calendars” option and my iPhone’s calendar was synced with my main Google Calendar in seconds! I guess a future iPhone update may add this functionality to the native Gmail / Google Mail account option to avoid any confusion. 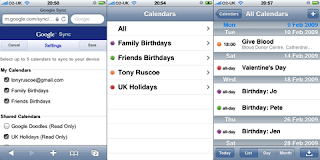 One downside is that you can only add one Microsoft Exchange ActiveSync account to your iPhone, so if you use calendars with multiple Google Accounts or Google Apps accounts, you’ll need to pick which account you want to use as your primary account and share your other calendars with it. Google Sync is in beta and there are still some known issues, but I’m really pleased with it so far and may even try to sync my contacts one day.